In space there’s no breathable air, microgravity wastes away your bones and muscles and you’re subjected to increased doses of radiation in the form of high-energy charged particles. But what are these sources of radiation and exactly how much is an astronaut exposed to? Space is a really inhospitable place to live – there’s no breathable air, microgravity wastes away your bones and muscles and you’re subjected to increased doses of radiation in the form of high-energy charged particles. These can cause damage to the cells in your body by breaking up the atoms and molecules that they’re made of. But what are these sources of radiation and exactly how much is an astronaut on the International Space Station exposed to over the course of a six-month stay? With the latest expedition about to return to the safety of planet Earth on June 18, I thought I’d have a look at the data to find out. The US National Oceanic and Atmospheric Administration monitors the levels of radiation at low Earth orbit using the instruments on board five polar orbiting environmental satellites. These orbit the Earth every 101 minutes. Since the Earth rotates underneath them, this allows us to build up a pretty comprehensive view of the space radiation at similar altitudes to the ISS every day. By flying the space station through the radiation map each day, we can work out the total amount of radiation astronauts receive. So where does all this radiation come from? While some of it comes from the sun, cosmic rays from unknown regions within our galaxy are also an issue – but have by far the smallest effect. The Earth’s magnetic field (and to some extent the weak magnetic field in interplanetary space) divert away most of these, meaning the radiation exposure due to cosmic rays – a mere six joules of energy over six months – is the equivalent of the average exposure of an average US citizen over 43 years, most of which comes from radioactive sources in the ground such as rocks. The main source of the radiation exposure at the ISS actually comes from a small patch off the coast of South America called the South Atlantic Anomaly. This region weirdly has a weaker magnetic field than its surroundings. This is important as it means this region is poor at reflecting charged particles from the sun and elsewhere in the inner Van Allen radiation belt – two donuts of radiation that surround Earth 1,000 to 60,000 kilometers above the surface – back out into space. While everywhere else this reflection happens at altitudes far above the space station’s orbit, the spot in the South Atlantic Anomaly allows these particles to penetrate to altitudes well below the ISS, which orbits at altitudes between 330km to 435km. The space station will only be subjected to this radiation a few minutes each day or so but its designers still had to take it into account, increasing the radiation shielding from the original plans. 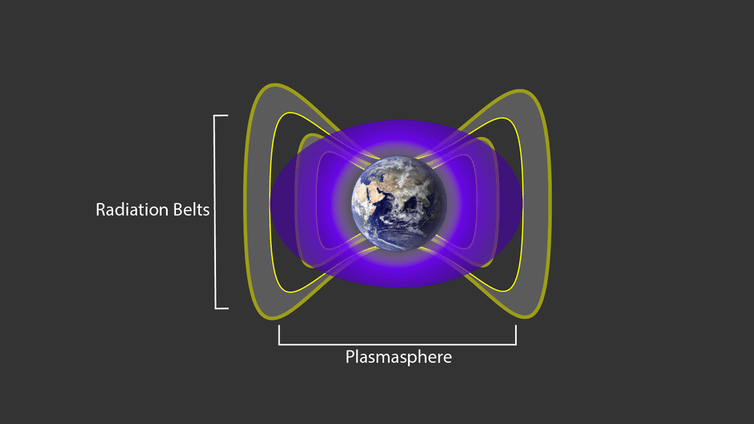 These radiation belts pose a severe problem to manned space missions. The only time we’ve sent astronauts fully through them was in the Apollo missions and thankfully the path taken and short exposure time helped reduce the dosage. NASA has admitted that shielding astronauts from the radiation belts is still a major concern. Plenty of unmanned tests are planned to see how effective our current shielding technology is. The final source of radiation at the ISS is within something called the auroral ovals. You can see the effects of this radiation as the northern (and southern lights) as the high energy electrons from the sun hit the top of the atmosphere causing colours of light to be emitted. Normally the astronauts can just take in the view of these beautiful displays, as the station’s orbit was designed to be at latitudes below where this usually happens. But sometimes, during what’s called a geomagnetic storm typically caused by solar activity, these aurora are found at lower latitudes and the space station can pass right through them. This did indeed happen a few times over the last six months, with at least two storms classed as major. When severe storms are expected, the astronauts have to hole themselves up in the most shielded modules of the station for protection. How to get around the radiation due to solar activity (such as so-called flares, solar energetic protons and coronal mass ejections) is still a massive question for future manned space flight. I took all these events into account in my calculations. So what was the total dosage for the astronauts at the International Space Station during this latest six-month expedition? This turns out to be around 300 joules, which is in fact that of a lethal X-ray dose. By comparison, we only get a 0.07-joule dose here on Earth in six months. Tests on mice don't bode well for travellers to Mars.